Pole Docks are designed for shallow water installations (typically less than 6'). Since very little of a Pole Dock touches the water it is the most environmentally friendly design and also the best in rough water. A pole dock is the least expensive docking solution since there is very little shoreline preparation required and the light-weight design and easy assembly will reduce your install and removal crew requirements. Every Designer Series Pole Dock is hand built from only the highest quality materials. Each system features a welded marine grade aluminum frame and Western Red Cedar decking. Stainless steel fasteners mean your system will last a lifetime without rusting. Designer Series Pole Docks come in a wide variety of sizes and custom designs allow for maximum flexibility. The dock frames have pre-drilled connection points, enabling almost any type of dock configuration. Each leg holder features a unique hand operated leg adjustment knob system eliminating the need for tools during in water installation. The dock has deck support sleepers every 16”, supporting almost any type of decking you choose to use. 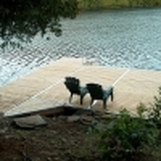 Docks are available as frame only or with Western Red Cedar decking. Our exclusive deck panel clips clamp decking securely to the frame. The Leisure Series Pole Dock is the most innovative leg dock in production today. It's precision made and light weight design bolts together instead of welding. This type of construction technique makes it a great package for a summer Do-It-Yourself project. Made from T-6 6061 grade aluminum its truss style webbed frame design assures an excellent weight to strength ratio. Only non-corrosive aluminum and stainless steel fasteners are in the docks assembly. Frames are available in 5’ x 10’ sections approximately weighing 70lb/32kg. The dock frames have pre-drilled connection points, enabling almost any type of dock configuration. The “Knockdown” design allows for easy shipping to anywhere and assembles with great ease. Its leg holders feature a unique hand operated leg adjustment knob system eliminating the need for tools during in water installation. The dock has deck support sleepers every 16”, supporting almost any type of decking you choose to use. Dock frame kits are available as frame only or with Western Red Cedar decking. Our exclusive deck panel clips clamp decking securely to the frame. Each Dock incorporates an special extruded rail enabling our EZ-Glide bumper strip to slide into place (no nailing or screwing). 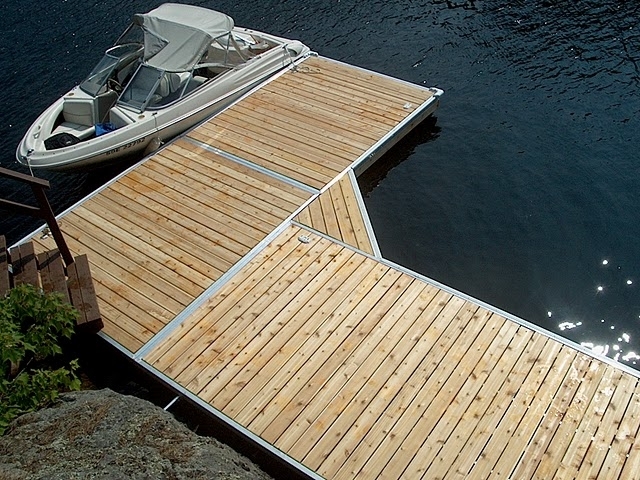 Aluminum legs, telescopic leg braces, leg holders and feet complete your dock. These frames come with an 8-year warranty. Docks are available for purchase in “Kit Form” or assembled. Delivery & Installation services are also available.